In 2117, somebody answered. A race known as the Vorrid struck Earth, one of the few planets left in the galaxy that was rich in resources. The Vorrid hit quickly, without warning. The human race united like never before in order to combat this new threat. Alien technology was re-engineered and genetic experiments created the perfect warriors to face the Vorrid in battle. The war raged on for decades and spread throughout the galaxy. The human race expanded, capturing territory, creating outposts and making their presence known. It was a brutal fight with their genetically engineered warriors making many gains. Finally, the humans fought the Vorrid to a standstill. A truce was signed and the war ended. Two hundred years later, the war but a memory , the genetically engineered race flourished and broke from their ancestors calling themselves the Cadien. There was an uneasy peace among races but the entire galaxy was dying and efforts quickly turned to survival. With human ingenuity and Vorrid technology new methods to travel were created and none too soon. Humans, Cadien and the Vorrid all pushed further than they ever thought was possible and a distant galaxy was discovered that appeared to be untouched by any race. This galaxy was named Galaxis. The book is out in print and available in eBook. That is very exciting! There is one more format that I am exploring: Audio Book. By publishing the book through Amazon, it was easy to move over to Audible. Audible runs the ACX, where authors and producers can connect to collaborate on projects. Today I registered with ACX and prepared an audition script for prospective producers. Now, I will be seeking producers to partner with to narrate and record the book. Once I find a producer, I will be sending him the full manuscript. I am not sure how long the process will take, as this is new territory for me. Still, I am very excited to be moving forward with the next phase. If anybody knows of any producers who specialize in audiobooks, please let me know. 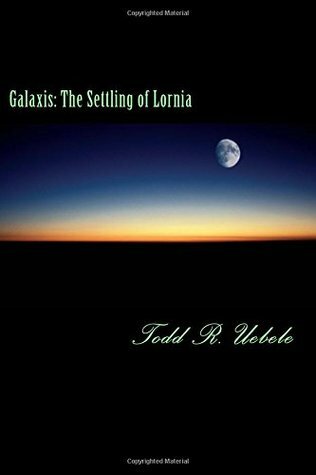 I am eager to move forward to the next phase and work with someone to get Galaxis: The Settling of Lornia released in an Audio Book format. “Galaxis: The Settling of Lornia” is now available in Trade Paperback and in Kindle Edition at Amazon.com. Links for both are at the top of this blog. I would like to thank everyone who has supported me in this endeavor. This book would not have been possible without the help and support of friends and family. From previewing the book, and providing valuable feedback, to sharing links on social media, I have had help from more people than I can count. I am truly grateful to each and every one of you. Now comes the real hard work…marketing the book, so that I can sell enough copies to make a difference by providing support to hurricane relief efforts. Author ToddPosted on September 21, 2017 September 21, 2017 Categories Book 1Leave a comment on It’s Released! Welcome to this corner of the galaxy! Galaxis is a book that has been on the cusp of release for a long time, so why now? What changed? Why is it finally being released? The answer is lies in the two hurricanes recently experienced by the U.S. Hurricane Harvey in Texas and Hurricane Irma in FL. I have deep, personal connections with people in both of those states, and I would like to help however I can. The book is being published to help provide relief to those who were affected. Having experienced firsthand the after effects of a major hurricane, I know that relief efforts and needs continue long after the stories of the storms leave the news cycle. Therefore, all proceeds from the sale of the book, from its release through the end of the year will go directly to hurricane relief efforts. I will be using my personal connections to send money to the affected areas in such a way that it will provide direct relief those those who are in need. Author ToddPosted on September 18, 2017 September 18, 2017 Categories Book 1Leave a comment on Why now?